500 Abarth with the “esseesse” kit is another important piece of the jigsaw in the ambitious project of Fiat Group Automobiles; the 500 Abarth fitted with the "esseesse" kit will make its world debut at the Paris Motor Show next week. 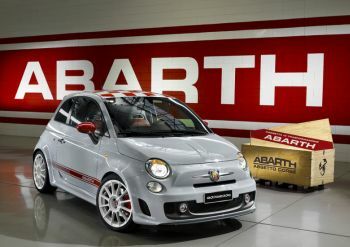 In line with the philosophy which has distinguished Abarth for half a century – to bring its racing experience to the market for road going cars and open up the world of motor sport – the 500 Abarth with the “esseesse” kit is another important piece of the jigsaw in the already ambitious project of Fiat Group Automobiles. The 500 Abarth fitted with the "esseesse" kit will make its world debut at the Paris Motor Show next week. True to Abarth tradition, the "esseesse” kit comes in an elegant wooden case and can only be sold and installed by the official network of Abarth converters, guaranteeing compliance with the highest testing and safety standards. In detail, the kit allows the 1.4 16v Turbo T-Jet engine to achieve a maximum power of 160 CV (147 KW) at 5750 g/min with peak torque of 230 Nm at 3000 g/min in “Sport Mode”. The result is a truly thrilling performance: top speed is 211 km/h with acceleration from 0-100 kph in just 7.4 seconds. In line with the Abarth concept of preparation, the “esseesse” kit uses perforated and ventilated front brake discs (diameter 284mm x 22mm), perforated rear brake discs (diameter 240mm x 11mm, high-performance front brake pads, springs that are specially lowered in comparison to the original car and Abarth “esseesse” 7” x 17” ET35 alloy wheels, finished in white or titanium, teamed with 205/40 ZR 17 Pirelli Pzero tires. The 500 Abarth "esseesse" upgrade kit will be topped off by the specific air filter powered by BMC, four tyre pressure sensors, “esseesse” badges to be applied to the engine hood and the tailgate, and a specially designed, highly original key cover.